The Top rating matches this weekend wasThursday nights AFLwhich pulled in 1,124,000 viewers. Thursday also proved a winner with the NRL and scored 942,000 viewers. 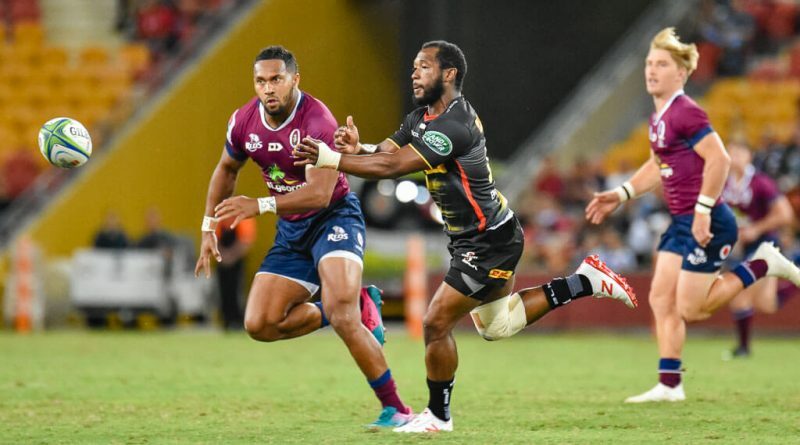 Friday night was Unions big night with 52,000 watching Reds v Stormers, while the top rating A-league game was on Saturday night and rated 25,000 viewers. 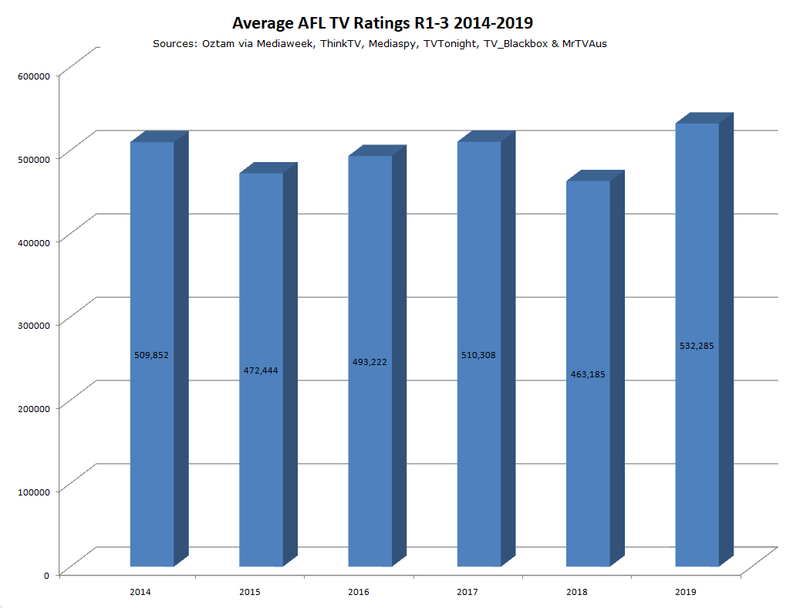 Total AFL TV Ratings for the round were almost 4.7 million as the AFL has its best start to the season in years. The AFL rated 2.27m in the Metro ratings area. Audiences in Sydney (+18%), Melbourne (27%), Brisbane (10%), Adelaide (12%) were up, while Perth is down 0.52% compared to the first four rounds of 2018, leading to an averall increase in average ratings to 280,000 (+14%) in metro areas. Regional broadcasts were watched by 771,000 people, as regional ratings jumped 35% on the first four rounds of 2018. Thursday nights Adelaide v Geelong match led the FTA viewing with 876,000 viewers,. Foxtel was watched by 1.67 million viewers, leading to an overall Foxtel season increase of more 12% to 184,000. Friday night led the charge with 248,000 viewers watching Sydney play Adelaide at Adelaide Oval. GWS v Richmond recorded 15,000 viewers per minute on Foxfooty, and was the only game this week to make it to the VPM charts. Seven doesn’t stream the AFL, and Kayo isn’t counted. Total NRL Ratings for the round were 3,783 million, as the NRL holds steady on its ratings compared to 2018. The NRL rated 1.2 million in the metro areas. Compared to the first four rounds of 2018, audiences are up in Sydney (33%) and Brisbane (15)%, while GEM cities (Melbourne, Adelaide and Perth) trail by 4.2%, leading to an overall increase in average ratings to 12.18% (404,000). Regional ratings stayed down 4.78% on the previous season, leading to an overall increase of 5.2% and an average rating of 643,000. Thursday night was the winner on FTA for the NRL with 690,000 viewers watching on the Nine Network. 1.9 million people watched the NRL on Foxleague, leading to an overall season decrease of just 0.03% on the same time last season. Sunday nights Knights/Dragons game top scored with audiences for 278,000. In another sign of the changing times, Channel Nine reports that 2.5 million minutes of live rugby league was watched in Round four, up 178% on the previous round 4. Eels v Sharks rated 18,000 on Oztams VPM system, while Cowboys v Raiders (17,000) and Panthers v Tigers (15,000) also rated a mention. As with the AFL, Kayo figures aren’t included. Only the first three games of the round had ratings reported, and these weren’t ideal, with Victory v Sydney rating 39,000 on Ten, and 25,000 on Foxtel on Saturday. Wanderers v Jets only managed 10,000 and the Friday game 21,000. Foxtels season average ratings dropped down to 35,000 for the year, but could be even lower due to the scarcity of data – almost ¼ of the seasons matches have unreported data. As with the others, streaming figures aren’t included. All four Australian Rugby sides appeared on Fox this week, attracting 173,000 viewers for their 4 matches. Fridays Reds v Stormers clash topping the weekend for Australian Super Rugby with 52,000 viewers on Foxtel, and a season average of 59,000.